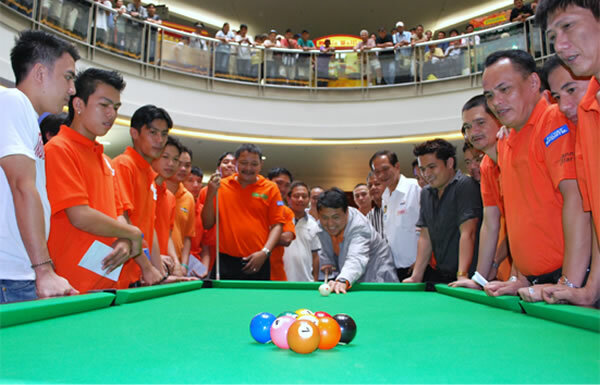 VILLARDS: The Manny Villar Cup – Billiards Tournament is a key project of Senator Manny Villar under his “Tulong sa Pagsulong ng Philippine Sports” program, which started in May 2008, with a 6-day kick-off tournament that happened at Starmall Alabang, Muntinlupa City. It showcases the world-class Filipino cue artists like Efren ‘Bata’ Reyes, Francisco ‘Django’ Bustamante, Alex Pagulayan, Dennis Orcollo, Ronnie Alcano, Roberto Gomez, Lee Van Corteza, Rubilen Amit, Warren Kiamco, Joven Bustamante, Ramil “Bebeng” Gallego and more compete against each other. VILLARDS CUP, also, creates a venue to discover future cue masters with its Sipag at Tiyaga Local Amateur Category, wherein amateur players from the host province or region are given the chance to develop their talents and compete side-by-side with the masters. Former amateur players, like Carlo Biado and Ricky Zerna, are already playing in international competitions and they are very proud to say that they have started from this cup, and surely have gone a long long way. Since 2008, VILLARDS CUP produced 10 winners and had been to Muntinlupa City, Cebu, Bulacan, Davao, Quezon City, Baguio, Isabela, Region 4-A and Iloilo to name a few. It also had a special Media Edition and has also been to the 21st Ad Congress in Subic, Olongapo City.